Homeowners today are using kitchen sinks and plumbing fixtures as an integral part of their home decorating. In fact, updating kitchen sinks & fixtures is an excellent way to give your room a quick and easy “facelift”. The recent trend of decorating with plumbing has brought the once simple kitchen sink to a form of art. Now, homeowners in Orange and Seminole County including Orlando, Oviedo , Lake Mary and Altamonte Springs can choose from a large variety of contemporary decorative sinks to fit both their budget and personality. There are decorative sinks available in nearly any material from stone, to metal to glass, to ceramic, which means there is something for every one. A decorative sink can be as simple as a square vessel sink painted in a color that complements the vanity top, or it can be as decorative as to include a painted border that matches a tile border elsewhere in the room. The sink truly is such an integral part of the room. Therefore, it makes sense to use it as a way to put the finishing touches on the room’s design. Kraus handmade stainless steel sinks combine fashion with function to create a contemporary look for the kitchen. Handcrafted from premium 16 gauge T-304 stainless steel for maximum durability, the extra-deep basins accommodate large dishes with ease. The tight-radius corners and clean lines of the design complement transitional and modern kitchens alike. 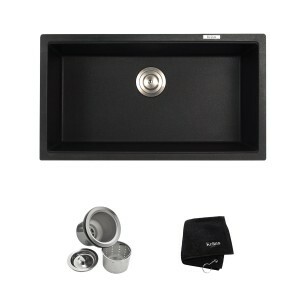 All Kraus kitchen sinks are equipped with top-level soundproofing, including thick rubber dampening pads. Each sink is additionally treated with protective Stone Guard coating, which reduces condensation and further dampens sound. The corrosion-resistant surface is further protected from rust and oxidation by a meticulous finishing process. Commercial-grade satin finish and rounded corners make maintenance as simple as wiping the surface with a damp cloth. This stylish single bowl sink provides a lifetime of functionality. 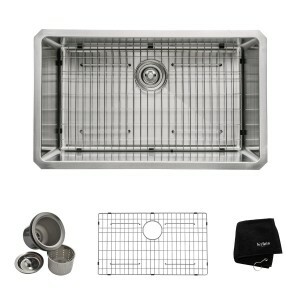 For added convenience, a basket strainer drain assembly and stainless steel bottom grid are included free with purchase. Each bottom grid is cushioned by soft protective bumpers to prevent scratching. Swan granite sinks are created with the clean lines, profiles and sweeping, organic curves that echo natural Elements. Swan sinks are made with 80% natural quartz stone, making them extremely durable, low maintenance; retaining their solid good looks for years. So whether you are looking for a modern decorative sink or something more traditional, we can help. We have been assisting residential owners with their plumbing fixtures for over 30 years in Orlando, Oviedo, Sanford and Lake Mary. Kraus handmade stainless steel sinks combine fashion with function to create a contemporary look for the kitchen. Handcrafted from premium 16 gauge T-304 stainless steel for maximum durability, the extra-deep basins accommodate large dishes with ease. The tight-radius corners and clean lines of the design complement transitional and modern kitchens alike. 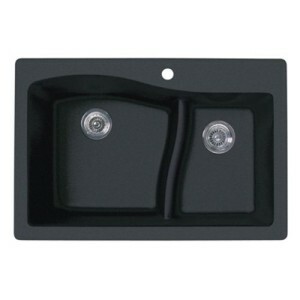 All Kraus kitchen sinks are equipped with top-level soundproofing, including thick rubber dampening pads. Each sink is additionally treated with protective Stone Guard coating, which reduces condensation and further dampens sound. The corrosion-resistant surface is further protected from rust and oxidation by a meticulous finishing process. Commercial-grade satin finish and rounded corners make maintenance as simple as wiping the surface with a damp cloth. This stylish double bowl sink provides a lifetime of functionality. The 50/50 split basin adds flexibility for a variety of kitchen tasks. 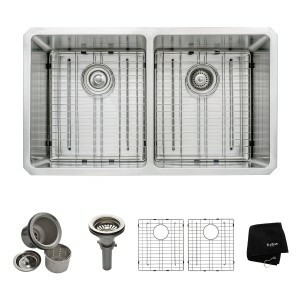 For added convenience, the sink comes with dual stainless steel bottom grids, a basket strainer, and a drain assembly, included free with purchase. 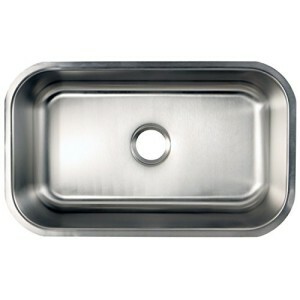 The single-bowl undermount kitchen sink features a long rectangular basin measured 30-Inch in length and 18-Inch in width. The basin contains more than enough space for washing kitchen appliances, preparing food and is made of high quality stainless steel for reliance and durability. The sink is also fully protected by a heavy-duty sound deadening pad to minimize noise while washing appliances in the sink. Since newer sinks are often much more complicated to install properly, Sam T’s Plumbing can assist in the installation process to save you time and the hassle. The Houzer PGS-3122-4-1 Premiere Gourmet Series Topmount Single Bowl Kitchen Sink is designed to look beautiful even in the face of the biggest jobs. Clean lines, polished curves and maXimum capacity for the biggest jobs. Additional features include heavy 18 gauge T-304 stainless steel, One faucet hole, flawless lustrous satin finish with high lighted rim, and StoneGuard undercoating over Super Silencer pad that helps reduce clattering sound of washing dishes. Bowl measures 29.25-inches wide by 15.75-inches by 9-inches deep and supplied with mounting clips, template and instructions. Meets ASME A112.19.3-2000, UPC and CSA standards and covered by limited lifetime warranty. Fits 36 inch cabinet. For over three decades, Houzer has been improving millions of kitchens across America and overseas, one sink at a time. Houzer offers over 100 sensational models in Stainless steel, Quartz Granite, Fireclay, Porcelain Enamel steel, and Copper to match any design from traditional to contemporary. Houzer believes that sinks can make your life in the kitchen easier and more enjoyable. 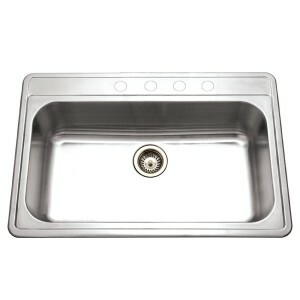 Revitalize your kitchen with a stainless steel sink from Moen. 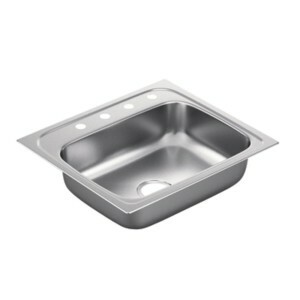 The 2200 Series offers 22-gauge stainless steel construction for sturdy functionality, and this drop-in model (G221984) features a single bowl configuration. This drop-in sink features Moen’s refreshed sink deck design — a minimal, transitional style that coordinates with a variety of decor and faucet designs. Thoughtfully designed, most of the deck is recessed so that sponges and other wet items that are placed on the inner ledge to drain back into the sink, and not onto the countertop. Moen sinks also feature SoundShield undercoating, which ensures exceptional sound deadening. A wear-resistant, uniform, brushed finish offers durability and resistance to chipping, cracking, staining or peeling. Kraus undermount granite sinks create an instant style upgrade for the kitchen. Constructed from 80% natural granite, with the look and feel of real stone, these modern kitchen sinks look striking in a variety of settings. Clean lines and thoughtful design details highlight the organic elegance of granite, for an eye-catching look with contemporary appeal. The extra-deep basins accommodate large dishes with ease, while the gently rounded corners make sink maintenance simple. Each non-porous, naturally hygienic sink is protected with a thermal finishing process, creating a surface that is highly resistant to heat, chemicals, scratching, chipping, and discoloration. 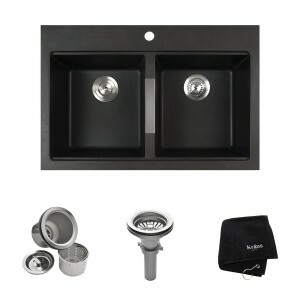 This single bowl sink provides a lifetime of functionality with refined style. For added convenience, a basket strainer drain assembly and complimentary towel are included free with purchase. Constructed from premium stainless steel, the top-quality basket strainer assembly creates a tight seal to prevent food and debris from clogging the drainpipe. Revitalize your kitchen with a stainless steel sink from Moen. The 2000 Series offers 20-gauge stainless steel construction for sturdy functionality, and this drop-in model (G202134) features a single bowl configuration. We have been assisting residential owners with their kitchen sinks & plumbing fixtures for over 30 years in Orlando, Oviedo, Sanford and Lake Mary. Thinking about upgrading your kitchen sink and faucet? Give Sam T’s Plumbing a call @ 407 359 7636. We will be glad to assist you with the right kitchen sink to revitalize your kitchen at an affordable price. We’ve been providing affordable high quality residential plumbing services through out Orange & Seminole County for more than 30 years. 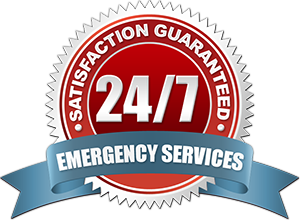 For more information or to request a quote from the plumber Orlando relies on, please contact us at 407-359-7636.